There’s no place in the world for train travel quite like Switzerland! The GoldenPass Line links three regions, two languages and eight lakes, tempting travelers to discover some of Switzerland’s most diverse delights. In the morning the timeless tradition of German-language Central Switzerland. Followed by the beautiful Bernese Oberland. And in the evening the French flair of Lake Geneva. The first stretch runs directly through the Swiss Heartland Untour. This first the modern Luzern-Interlaken Express takes travelers along the lovely lakes of Alpnach, Sarnen, and Lungern, climbing to the Brünig Pass and then descending to Meiringen. The trip continues along Lake Brienz to Interlaken, where passengers board the BLS RegioExpress. This train travels along Lake Thun through the Swiss Oberland area and the scenic Simme Valley to Zweisimmen. From here, change again to the MOB Panoramic of the Montreux Bernese Oberland Railway to Gstaad and finally to Montreux on Lake Geneva. This trip in a trio of trains can be enjoyed in either direction. The Sarnersee – embedded in a pre-Alpine landscape in Central Switzerland – is popular for its easy and attractive hiking trail around the lake. Attractions along the way include Sarnen’s historic old town and several churches. Lake Lungern and its splendid setting make this region an absolute must-visit for hikers and walkerS, as Untourists know well. The lake is a natural reservoir in Canton Obwalden between the villages of Kaiserstuhl and Lungern and can be reached via the scenic Sarnen Valley. The Brünig Pass links Canton Obwalden with the Bernese Oberland and can be crossed by road or rail. Between May and October, train passengers can catch sights of wild animals on the Brünig Safari. Thirteen life-sized hand-carved wooden creatures are waiting to be discovered along the route – it’s just like a real safari! Nestled between the Emmental and Bernese Alps, Lake Brienz captivates visitors with its unique turquoise hues. The railway line runs along the steep northern shore of this popular pre-Alpine lake. The BLS Lake Navigation Company operates a fleet of four motor vessels and one historic paddle steamer. Interlaken is located between the lakes of Brienz and Thun, at the foot of the towering trio of the Eiger, Mönch, and Jungfrau. The resort is an ideal point of departure for many holiday excursions. In Interlaken Ost, GoldenPass Line passengers change from the meter-gauge trains of the Zentralbahn to the normal-gauge trains departing for Zweisimmen. Lake Thun extends from Thun to Interlaken and is the largest lake located entirely within a single Swiss canton. The BLS fleet offers a variety of interesting theme cruises and relaxing round trips. Undisputed star is the historic Blümlisalp paddle steamer, a classic vessel built in 1906. The scenic Simme Valley is named after the Simme River. The breeding and export of Simmental cattle brought early affluence to the region, resulting in the construction of magnificent timber farmhouses with their fine facades. Many examples of the art of Simmental carpentry and craftsmanship can be admired during the train journey. Zweisimmen lies at the confluence of the Grosse and Kleine Simme rivers, and is a departure point for high-altitude hikes throughout the region. It is here that passengers change to the gold-colored Panorama or Classic trains of the Montreux-Bernese Oberland Railway (MOB). Gstaad is an internationally renowned resort, famous for its chic chalet-style houses, car-free center, and exclusive restaurants and hotels. Popular with the rich and the famous, glamorous Gstaad hosts annual sports and cultural events such as the FIVB Beach Volleyball World Tour, the Davidoff Saveurs Festival for star chefs from all over the world, and the Swiss Open Gstaad tennis tournament – the “Wimbledon of the Alps” as some call it. Saanen is the last German-speaking village along the GoldenPass route to the French-language Lake Geneva Region. The village is renowned for its artistically intricate scissor-cuts and other rural handicrafts (attractively exhibited in the Museum der Landschaft) and famous among food-lovers for its finely-sliced Alpine cheese. It was here in this idyllic Alpine setting that eminent violinist Sir Yehudi Menuhin (1916-1999) founded his Menuhin Festival nearly 60 years ago. For a longer excursion and to enjoy the French-speaking part of Switzerland, continue on the MOB Panoramic to Montreux on Lake Geneva. 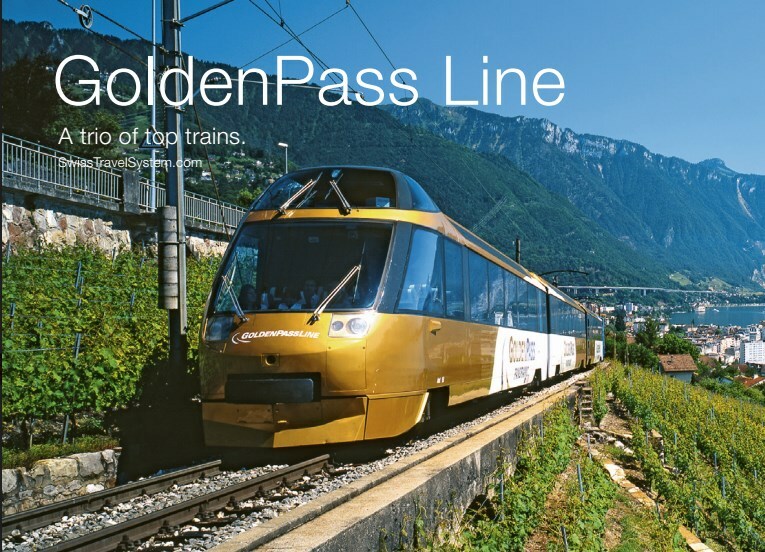 Enjoy the Swiss rail system and the pass that comes with your Swiss Untour!